Review by AllTheBestFights.com: 2016-02-05, good pace with some tough exchanges: Randy Caballero vs Ruben Garcia gets three stars. The former IBF Bw champion Randy Caballero entered this fight with a perfect boxing record of 22-0-0 (13 knockouts) while his opponent, Ruben Garcia, has an official record of 15-1-1 (6 knockouts). Caballero is not ranked as he hasn’t fought since October 25, 2014 when he defeated Stuart Hall (=Caballero vs Hall) while Garcia fought four times last year losing once, against Rafael Rivera. 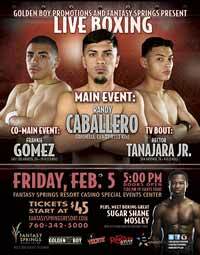 Caballero vs Garcia is the main event of the evening. Watch the video and rate this fight!